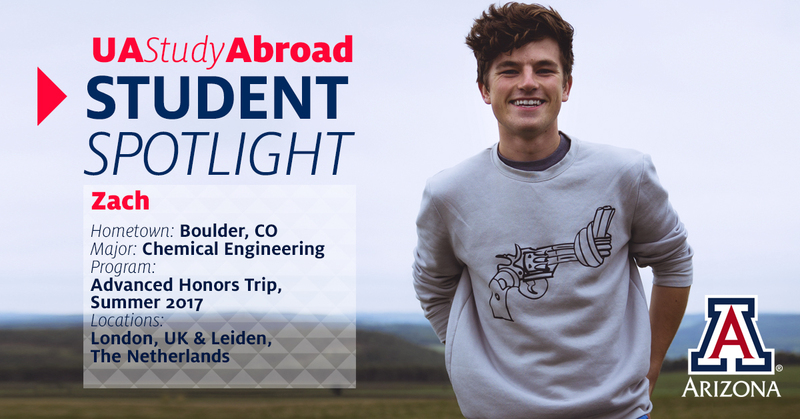 UA Study Abroad is excited to announce Zach Westman as our first Student Spotlight! Read on to learn about his experience in Europe on the Advanced Honors Trip. Why did you choose the Advanced Honors Trip? I've never traveled abroad before, so the opportunity to do so while exploring STEM topics was really appealing to me. London is such an incredible city with tons of culture and history, and I was definitely excited to try living in a really big city for a couple of weeks. As cool as London was, though, the Netherlands was definitely the main attraction of the trip for me. The country is unbelievably beautiful, and I've always been super interested in the culture and the innovation of the Dutch. What is your best memory of the program? On one of our last days in the Netherlands, we took a train down to a beach in The Hague. It was a little chilly, but we spent the evening walking up and down the shore and watching the sun set over the ocean. It was absolutely beautiful and an experience that I'll never forget. How did the program prepare you for future professional goals? Studying abroad gave me a more global perspective on what I want to do with my life. It's really easy to get caught up in the details of classes that you take during the normal fall and spring semesters, but studying abroad gave me an opportunity to actually get out and see many of the issues worldwide that could use my attention. Actually getting to see where I can apply my passions to real-world situations was really helpful and will help guide my decisions on graduate school and beyond. Where would you like to travel next? I'd love to go to Iceland! It looks like a gorgeous country and I'd love to just spend a couple weeks exploring out in nature with my camera. About the Advanced Honors Trip: The Advanced Honors Trip is open to all honors students, but may be especially interesting to those in the STEM fields. Students travel and experience new cities and countries, exploring ideas about the relationship of art to engineering, and science to literature and music. This program will run next in summer of 2019. About UA Study Abroad: UA Study Abroad in the Office of Global Initiatives inspires students to make learning their own adventure. We offer more than a hundred programs across dozens of countries, with offerings that span one week to one year. Start your journey here.